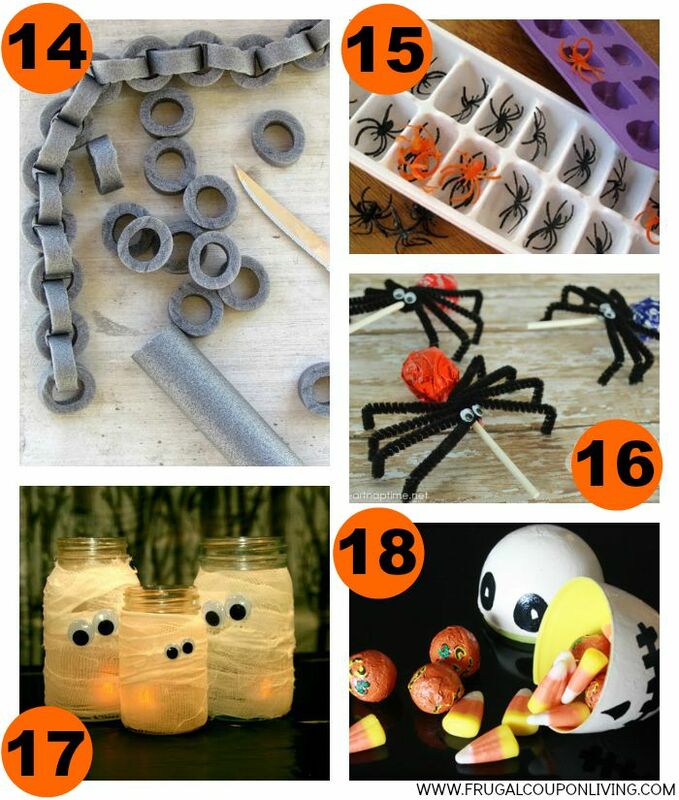 Last week we shared with you our 31 Days of Kid’s Halloween Food Crafts, this week we have some exciting Halloween Hacks & Tips. I can’t get over how cool these are! 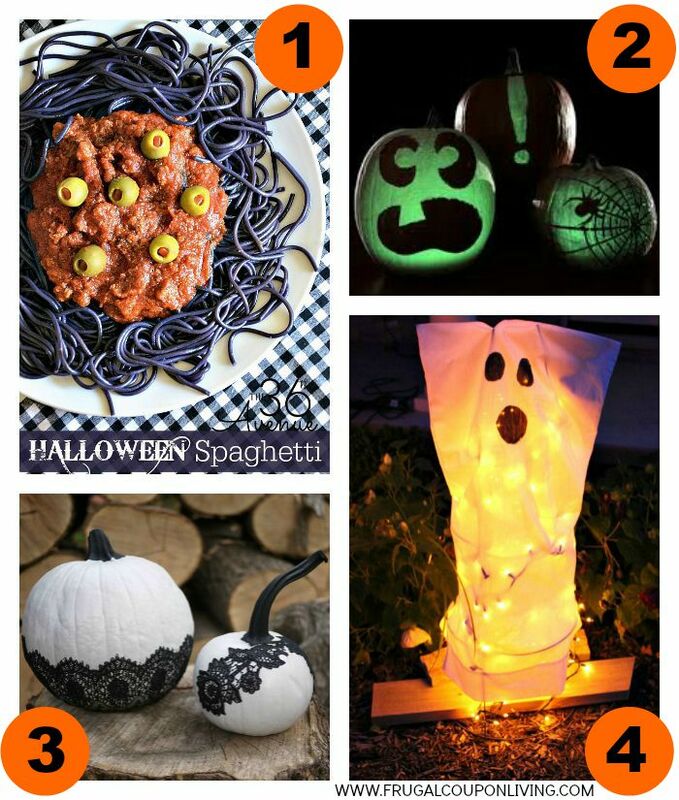 From the most frightening plate of spaghetti to spooky porch décor, gobs of candle inspiration and so many pumpkin ideas your head will spin. Check out the best ways to carve and preserve your pumpkin too! You’ll be set for a Halloween to remember! 1.) Have fun with an October or Halloween dinner with this Spooky Spaghetti from 36th Avenue. 2.) Instead of carving your pumpkin, create a Glow in the Dark Pumpkin from Steve Spangler Science. 3.) Another way to decorate a pumpkin is to Decoupaged Lace Pumpkins from Honestly WTF. 4.) These Tomato Cage Ghosts from Princess Pinky Girl look great for the yard. 5.) Go to the Dollar Store and raid the Christmas villages and makes a Halloween Village from The 36th Avenue. 6.) 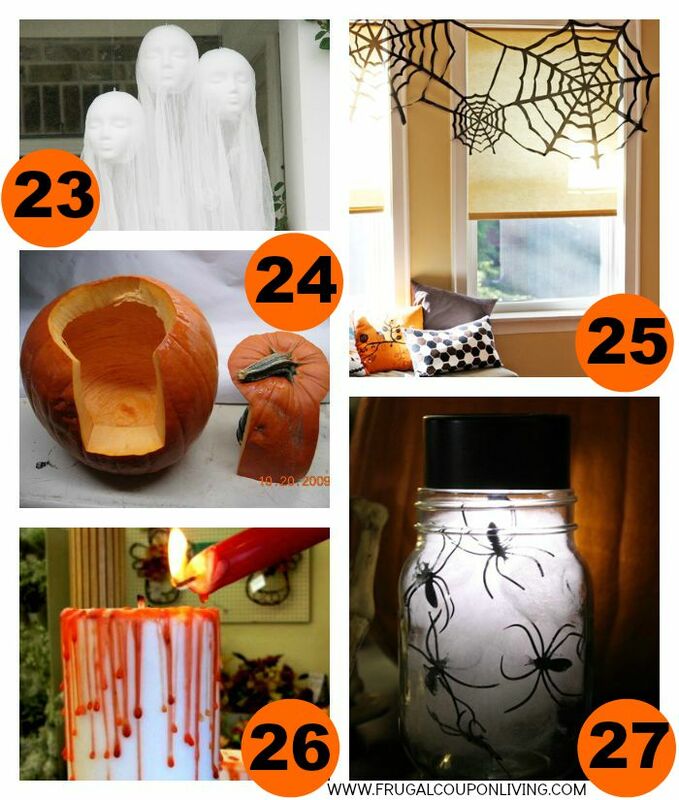 This is a fun and up-cycle way to decorate for the season, we love these DIY Milk Jug Ghosts from i Save A to Z. 7.) For the kids, this is a Homemade Edible Blood Recipe from Homemaking Hacks. 8.) Grab some old glass vases and have fun with this craft, Candy Corn Vases from The Swell Designer. 9.) 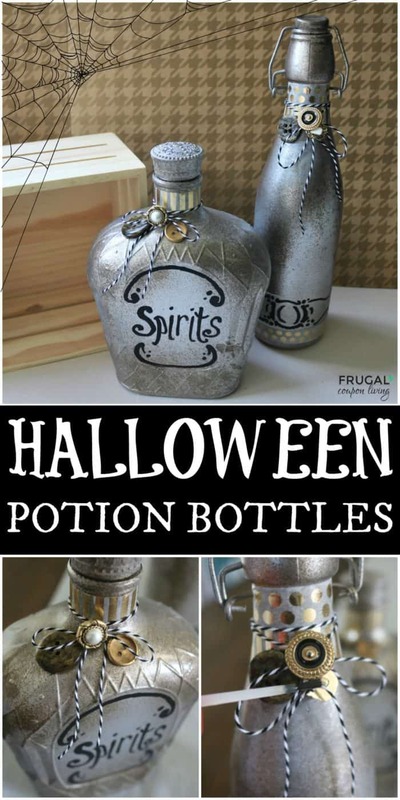 Who would have thought, take old Pill Bottles and make these spooky Halloween Spell Bottles from Magia Mia. 10.) 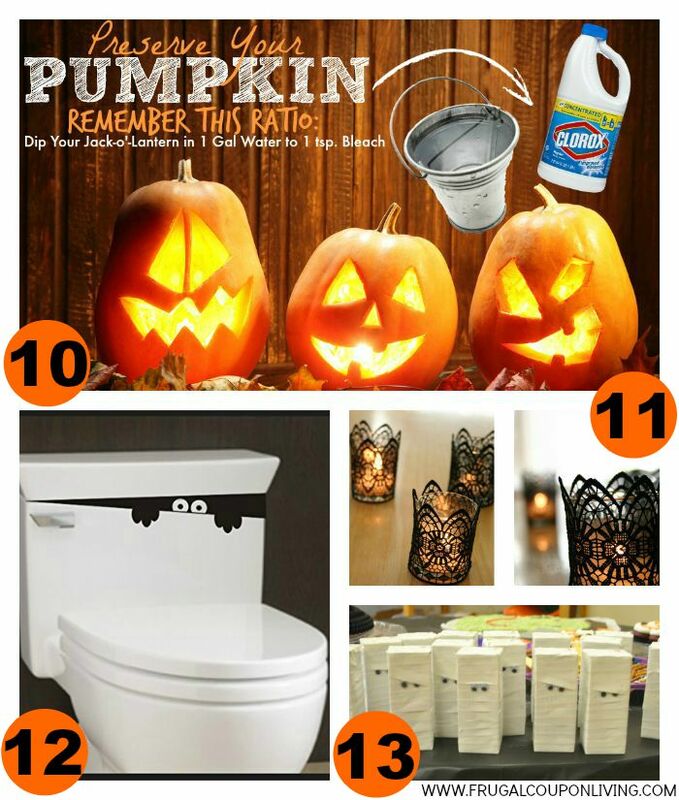 Make your carved Pumpkin last longer with this Pumpkin Carving Hack on Frugal Coupon Living. 11.) These Black Lace Candles from Big Ang could be fun for other times in the year! 12.) Don’t forget to decorate the Toilet with this Vinyl Toilet Monster Eyes Hands and Hands. 13.) Real easy craft, great for a classroom. Make these Juice Box Mummies from The Peanuts Gang. 16.) Another great classroom treat, these DIY Spider Suckers from I Heart Naptime are so easy! 17.) Another easy craft, how cute are these DIY Gauze Mason Jar Mummies from Crrafts Redesigned. 18.) Take old Easter Eggs and make these Skeleton Head Halloween Eggs from Tallys Treasury. 19.) 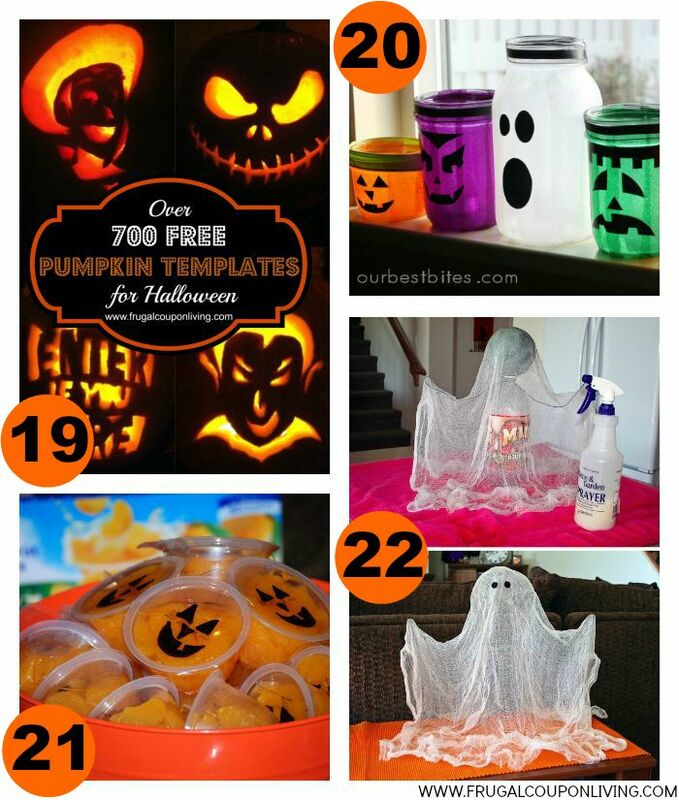 This is a must pin item for later, check out these 700 FREE Pumpkin Templates from Frugal Coupon Living. Pin to Pinterest. 20.) Get creative, we love these DIY Halloween Mason Jars from Our Best Bites. 21.) A awesome and easy classroom treat, Jack O’ Lantern Treat Oranges from Pimp My Dinner. 22.) WHO KNEW – make these homemade Floating Ghosts from Every Day is a Craft Thing. 23.) 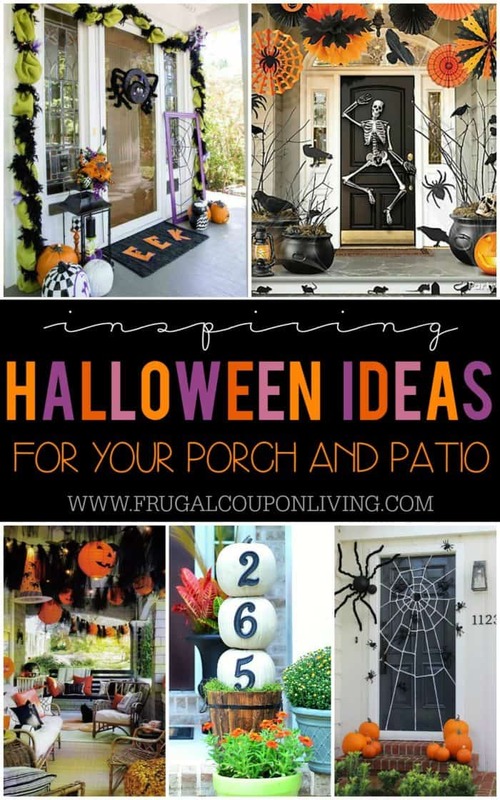 These are spooky, decorate your porch with Floating Head Ghosts from Simply Designing. 24.) I heard this was a great way to carve a pumpkin and easily scoop out the inside. Take a look a this Alternative Pumpkin Carve from Makezine. 25.) I love how cheap these Halloween spider webs are, look at these Trash Bag Spider Webs from How About Orange. 26.) 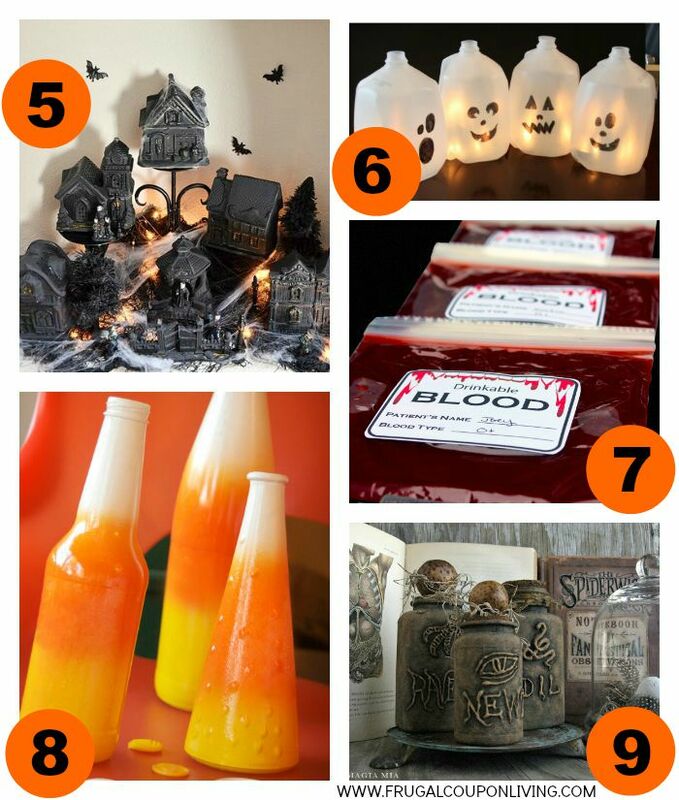 Who knew making Bloody Pillar Candle from Vicki O’Dell is so easy? 28.) 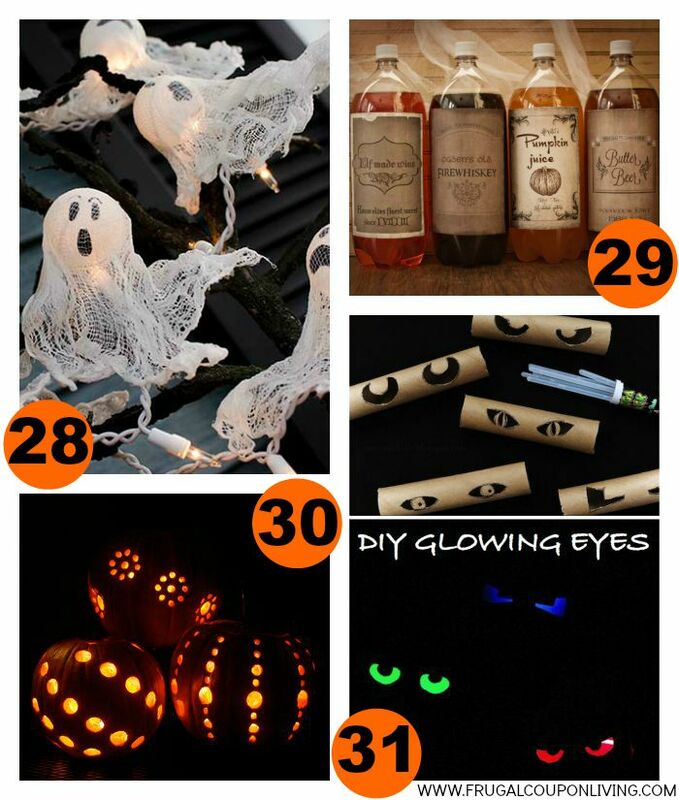 Who loves a good festive light, these Halloween Ping Pong Ball Ghost Lights from Unoriginal Mom are so creative! 30.) Another fun ways to carve pumpkins, Carve Pumpkins with a Drill from The Garden Glove. 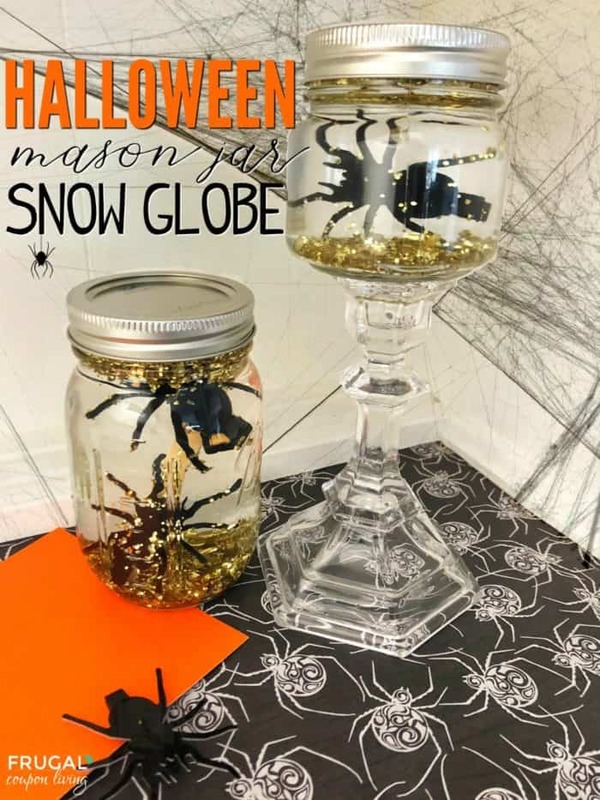 Create your own DIY Halloween Mason Jar Snow Globes. Pin to Pinterest. 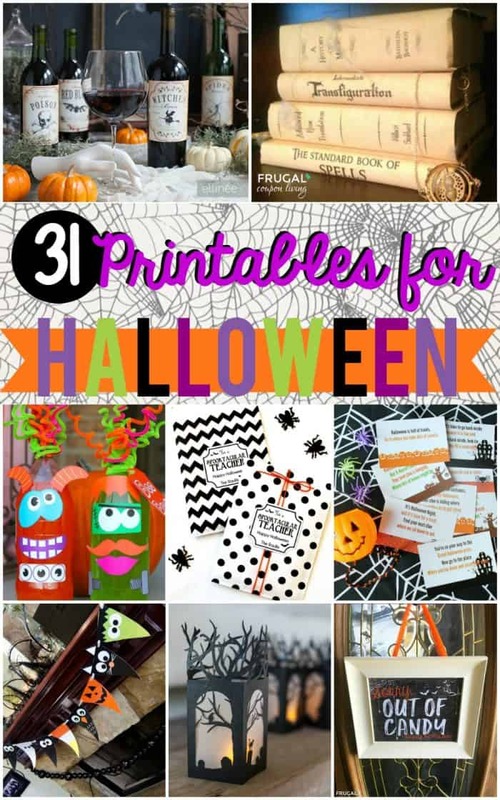 Don’t forget our 31 Days of Kid’s Halloween Food Crafts. Pin to Pinterest. 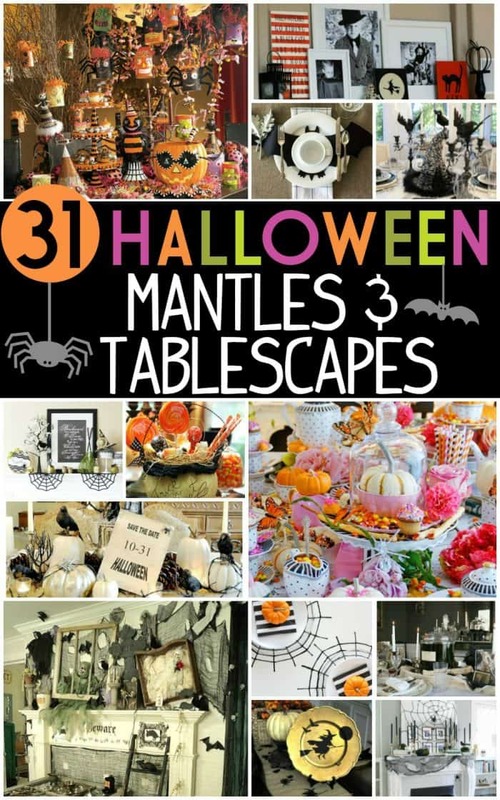 We had fun with these 31 Inspiring Halloween Mantles and Tablescapes. Pin to Pinterest. Be sure to make this fun craft! Our very own Halloween Potion Jars. Pin to Pinterest.